The Porchlight Parade | The stream of thoughts parading through the mind of a young dreamer, as she sips her wine under the porchlight. After much poking and prodding from my very near and dear and far and pleasantly unsurprising support system, I have returned to one of my sources of true and infinite joy–writing! Life lately has been a bit of a doozy to say the very least–and I have finally–again, with quite a bit of support and urging from my mirrors–found the inspiration to view it all as the blessing and grand adventure I needed to bring me exactly where I need to be. I recently experienced one of the most unnerving horrors of adulthood in the form of a ceaseless toothache, complete with a swollen gum. Which I tried to ignore until my darling fiancé gave me the number to his dentist (because up until a week ago, I’d been avoiding my dentist like the plague–convinced that I’d chosen the Dr. Orin Scrivello of San Diego). Not so long story even shorter, I ended up needing a root canal. Being the strong, mentally and financially stable, young adult that I am not yet, I was calm cool and collected as I found myself barely listening to my dentist explain the process of drilling down through my tooth to clean out the roots and only he knows what else he said, while my mind drifted back to that scene in Little Shop of Horrors when our sadistic Dr. Scrivello is going to town on his poor unsuspecting patient. I flashed back to all of the other conversations I’ve ever heard from real adults about root canals, and couldn’t recall any of them being told in excitement. The deafening thump of my nervously beating heart and endless buzz and hum of the drills lulled me into a peaceful state; and I began to reflect on the past year and a half, and all of the stress, TRAFFIC, and mayhem that until very recently (read: this week) made me feel as if my life were spiraling wildly out of control. So many times over the past year or so I’d felt as if I’d hit rock bottom. That time I left my dream job in my dream city for bumper to bumper traffic and a cubicle with no windows; that time I nearly stalled in the middle of a four way intersection; that other time I wrecked my car in 4AM traffic–that’s not a typo–TRAFFIC at 4AM; that time that same car got towed after I searched for an hour in the middle of the night looking for a legitimate parking spot; that time I left my wallet in the McDonald’s on the corner where the drag queens knew me by name, and learned that the person attempting to use my card was embarrassingly close to my limit; that time I returned to my dream job in my dream city and it wasn’t nearly the same; etc. etc. etc. My ever hopeful (somewhat naïve) spirit thought, it couldn’t possibly get any worse than this–only to be shown that it absolutely could and would. Rock bottom kept getting lower and lower until I found myself explaining to my mother that my default emotion was pure anger. Sure there were moments of joy and excitement, but for some strange reason, my thoughts, my world, my existence were poisoned with all of the stresses and unfortunate events of recent history. It was as if I were in an endless free fall towards a rock bottom that was so far below me, I could no longer look back to the light above. Beautiful. Majestic. Physically defiant. Seemingly endless structures, reaching all the way up to kiss the sky. Skyscrapers aren’t built on just any ol’ foundation. One can’t be built on a slab on top of the dirt. You have to dig deep into the soil to begin the foundation. And not just any ol’ soil, it has to be the right kind, or you have to mix in the right materials to strengthen the soil to support the foundation. The foundation must be deep enough in a soil that is strong enough, and mixed with the materials that are just right, so this regal structure, reaching high enough to kiss the sky, can withstand the pressures of the wind, the natural shifts and changes within the earth, the ever unpredictable and unyielding wrath of the weather. The foundation must be deep enough, in just the right place…like life, like growth. I guess root canals aren’t so bad. I get to keep my tooth, my gums feel much better, and I’m actually not in a ceaseless downward spiral towards rock bottom after all. I’m digging deep and cleaning out the roots of negativity, and adding the materials, the experiences I need, to build my foundation. This life, these moments, these experiences are the very things helping me to withstand the forces of the world around me. They’re allowing me to stand beautifully and majestically, despite the unexpected shifts and changes in my world. I meet a lot of people in my line of work. All sorts of people. Some interesting; some not so much. Quite often these people tell me their stories, and sometimes they truly resonate with me. She’d just returned from celebrating her grandmother’s 97th birthday. She spoke of the fun she had and all of the sweet and witty things her grandmother spoke on her big day–all I heard was 97. This woman was 97 years and counting! My head began to spin. You know that saying, “Life’s too short…”? Yeah, I’m not buying it. 97 years doesn’t sound too short to me. Do you know what could happen in 97 years?! A lot happens in the hour that (with the help of my snooze button and lack of discipline) quickly turns into 47 minutes I give myself to get ready for work! I think about the times at work when the pilots ask us to remain seated for a period of time during turbulence. Just the 15 minutes of idleness while waiting for them to navigate and find an altitude with smooth air nearly drives me mad. Imagine spending 97 whole years idle, waiting for the smooth air to get back to your routine. It’s insane. It makes me see things a bit differently. “Life’s too short,” huh? I always took that saying to mean that you had to hurry and do all of the things you’ve always wanted or needed to do before it was too late; but now I’m starting to believe we’ve had it a bit backwards. Many of us have plenty of time. We just have to figure out how to fill it. We have to truly live. We must sincerely be. We must do meaningful, enriching, fulfilling things without hesitation. We can’t just sit idly, waiting for the end. We can’t live our long lives anticipating a few epic moments–lest the stories we create be as long, boring and drawn-out as the third book of the Hunger Games trilogy (no offense, but Mockingjay was definitely a brick until the very end). Eventually it ends. But in the meantime, there is a life to be lived. Life is everything you make it. Life is everything to you do…or don’t for that matter. Every so often I have one of those moments likened to an out of body experience, where I’m watching myself do something incredibly stupid, all the while thinking to myself ‘Morgan, that’s a bad idea,’ while still doing it anyway. Let’s talk about the time I almost lost my right thumb. You know the important one. The one that I absolutely must have for just about every moment in life (you will never truly appreciate the importance of your right thumb until you almost lose it.) Okay, I’m definitely being overly dramatic, but it did hurt something awful. Onward. One peaceful summer night, working a red-eye home from Maui, I and my lovely crew were discussing our eating habits and healthy snacks we could or should bring on our trips. Ever inspired by their suggestions I decided that upon arrival, I’d head straight to the store and get some fresh veggies and new knives and peelers and all the other cool kitchen gadgets I would need to begin my healthy snack packing regimen. Upon landing, I decided to postpone my nap and headed straight to Walmart (yes, Walmart. It’s actually an okay place at 8 in the morning). I returned home just an hour later armed and ready with my razor sharp goodies and bags of fresh veggies. Being the first time actually slicing bell peppers with something other than a rather dull steak knife (I know, I know. ), I chose to read the directions located on all of my new slicers and peelers. Package after package advised and cautioned me to be careful of the sharp edges of the blades, the mandolin even had a nice little plastic film over its blade echoing the same warning, adding that I must never slice fruits or vegetables without the included hand guard. I carefully washed all of the new tools and rinsed the pesticides from my veggies (because who am I kidding, I still eat Taco Bell, there’s no way I’m taking the time to look for all organic veggies) and I was ready to go! The first pepper didn’t go so well. I tried slicing quickly, then a little more firmly, maybe slow this time. Each slice ended up jagged and uneven, if I could even cut through the thing at all. That darn hand guard just wouldn’t allow me to get a good grip. I tried my sweet potatoes next. Maybe some nice thinly sliced sweet potato chips would be in the near future. Nope. I could barely get the potato to slide across the blade. This darn hand guard was standing between me and my healthy snacks. It must have been the delirium of having worked a red eye and braving the aisles of Walmart without my morning nap that gave me the bright idea, that perhaps, just maybe the warning labels were just overly cautious, a way to negate liability if someone accidentally cut themselves. It wasn’t guaranteed that I would hurt myself if I didn’t use the guard; it was just a precaution, right? Nope. One quick slice proved me undoubtedly wrong. I’ll spare you the details, but I will say my next few hours did not include a nap or any homemade sweet potato chips. With half a roll of paper towels scotch taped around my thumb and the advice of my dear friend Sarah, I made my way to the Urgent Care. After being laughed at by two assistants, I was seen by the doctor who would tell me my fate. Fortunately enough, I could keep my thumb; unfortunately, it would take quite a bit of time to heal. I’d sliced clear through the side of it and the poor sliver of flesh was hanging on for dear life. Doc gave me two options: I could keep it bandaged up for a few days until the sad sliver of flesh shriveled up and died, which would then begin true healing process; or I could get a few stitches, which would keep the sad sliver of flesh in place until it shriveled up and died, which would then begin the true healing process. At that moment I learned one of the most valuable lessons I ever needed. Throughout life you’ll do dumb things, or make poor decisions, or even good decisions, that will yield painful outcomes; yet no matter which way you choose to go about correcting or dealing with said outcome, the process to heal will be the same. There will be times when a part of you will just have to shrivel up and fall away before you can fully heal or move on, whether you choose the stitches or not. Have you ever text your BFF to relay your heartbreak after finding out (through your unmentionable, borderline crazy, stalker-like, super-sleuthing skills) that your long-time crush has a girlfriend, only to realize after receiving a quick and unsympathetic “LOL” that you’ve actually sent her a text about your long term “curds having a new guestroom”? Ever been talking to one of your best friends, who knows pretty much everything about you; you know the one who knows and understands how your mind works, about something you’re truly passionate about and just as she nods her head and finishes your sentence, you realize that while the completed statement makes perfect sense, and compliments the essence of yourself perfectly, it’s not quite what you meant? Ever have one of those deep, life-altering conversations with your best-friend, mom, mentor, coworker, (insert other important individual whose opinion you truly value), meant to help figure out your purpose or next big move in life? Ever finish the conversation feeling like you’ve got this whole ‘adult’ situation figured out, and that “‘the world is your oyster,” only to later remember the person you actually are and realize that whatever you’ve come up with is never going to happen–not because it isn’t possible, but because you genuinely have no interest in that course of life? That’s pretty much been the story of my adult life. I recently had a conversation with my coworker, after which I was completely convinced that my dream life included moving into a cute little apartment on the beach in Puerto Vallarta. I listened with immense enthusiasm as he described how beautiful it was and how affordable it would be to have my cute little dream home. I could almost smell the salt of the ocean air as he explained the simplicity of my future commute. I began to map out my new move in my mind. Should I change bases and commute to Seattle and just crash with my mother? Should I find a cheap little crash pad in San Diego? How would I arrange my schedule? When would my friends be able to visit? When would I move? I had so many things to figure out, but it would all be worth it when I am listening to the ocean from the back porch of my sweet little dream home. Because, I’ve finally learned to proofread, so to speak. I’m at an interesting point in this journey ‘they’ call life. I am ever discovering more about myself and the way I want my life to pan out (not that I have complete control over that per se, but that’s neither here nor there). Recently, I have realized that as a young adult it becomes quite easy to fall into the trap of making major life decisions and accepting parts of oneself in the same manner in which we send texts filled with typos. We trust that our loved ones (our real-life auto-correct) know enough about us to fill in the blanks. We choose to live and press send, only to later look back and realize that someone else has filled in his own idea of what our lives should be; and while what’s been changed or input ‘made sense,’ it very well may not have been exactly what we intended for ourselves. As I meet and get to know so many wonderful people, I am ever inspired and dreaming anew; but, I have learned and am learning that some things are meant to remain an inspiration, rather than a part of my journey. I am quickly learning the importance of self-reflecting and editing before sending that text to my bestie about the super hot guts I met on my flight while making plans to move to Mexico. I’ve always been pretty quick witted. I got that from dear old dad. As I’ve gotten older and had the opportunity to work around so many personalities which are usually accompanied by differing levels of sensitivity, I’ve learned to keep my witty quip and sarcastic thoughts to myself (and my coworkers in the back galley, of course). Now, logical, empathetic Morgan knows that they’re asking, not because they want to know the exact moment the wheels will touch down, rather they’re trying to decide whether or not they should have that second glass of wine, or if they have time to start another movie on the digE InFlight Entertainment Tablet, or if it’s time to start looking for little Hunter’s shoes, or do some galley yoga. ***Just a note: there is never a good time to do yoga in the galley. After spending nearly all of my life in Sweet Home Alabama I made the decision to jump ship and moved to Seattle to begin the career of a lifetime. A little over a year later, after having to work through my sister’s baby shower (yup, still salty), I made the decision to move to San Diego. Best decision ever, by the way! I’d like to say my willingness to up and move on a whim and fly by the seat of my pants was due to how confident and strong I am as a pseudo-successful young adult, but that wouldn’t be entirely truthful. The whole truth is that my moves were the questions I had to ask myself in order to figure out who I was and who I am; my moves begged the questions I did not yet know I had of myself. Could I leave everything and everyone (except Momma) and start over with new friends, in a new city and be truly happy? Do I really want to leave home or do I just need a break from my southern roots. Am I still who everyone else knows or is there more to me? What else is there outside of what’s been nurtured by the people who are used to me? Sometimes we ask questions for the sole purpose of simply knowing the answer. Quite often we ask questions, whether to another or through experience and experiments, in order to figure out our next moves and learn about ourselves. More often, these questions tell us more about ourselves than the actual answer. When I was younger I dreaded doing the laundry. Oh how I loathed having to match up the seams of my jeans before placing them on a hanger, and lord forbid having to fold a fitted sheet (which I still have no clue how to do). Now, I take great care and pride in sorting my clothes into neat little piles and separating my shirts in my drawers based on which occasions I’d be wearing them. Every week I walk through my apartment ducking around vines of bra straps, pant legs, and pantyhose. My place becomes a jungle of slightly damp clothing, all in an effort to preserve the quality of my wardrobe staples. It was after midnight and I found myself hunched over my kitchen sink hand washing my bras one by one. Why? Because I’d just gotten home from being away for almost two weeks and I needed clean undergarments in the morning. Sure, I could have tossed them in the washing machine and dried them on high in the morning– I’m sure, I’d have had time before I left the next morning, but it just wouldn’t be right. I was exhausted. The smell of lavender scented Gain had me in a trance. It took everything in me to hang my jeans and pantyhose at optimal air drying distance from one another, but I made it happen. Why was I going through all of the trouble? The laundry room was just across the hall. I had just gone to the bank for my usual two rolls of quarters, and I even had matching lavender dryer sheets. Why not just toss them in the dryer and head to bed? My neon colored holsters with convertible straps offer all of the comfort and support my young ladies ever need. My jet black medium support control tops with the reinforced toe keep the thundering of my thighs to a dull tremble. My dark wash, medium waist, skinny leg give structure and lift to the ‘southern charm’ I now carry behind me (thanks Mom). How dare I even consider tossing my most supportive articles into the dryer as if they were some old high school Stress Fest tie-dye t-shirts? It just wouldn’t be right. As I’ve gotten older I’ve been blessed with a life full of new adventures and experiences. I am meeting new people and seeing new places and doing new things; and life is happening. I’m living! I’m experiencing! I’m learning! I’m doing! But amid my laundry daze I am reminded that as exhausted as I sometimes feel, and as late as it may seem, it is imperative that I cherish those who provide me structure and support. As easy as it would be to care for and treat my closest friends and family as I do everyone else, I have to remember that they aren’t the same. If I want to maintain the quality of my relationships, I must take the time to care for them and nurture them. I can’t allow my relationships to become misshapen enough to lose their support, or allow small snags to become irreparable runs and holes, or allow the beauty of my friendships to shrink and fade, because it’s easier to lump them in with how I treat acquaintances. I find the excuse, ‘That’s how I am with everyone,’ quite irksome, when it’s told to me; I often wish to reply, ‘But, I’m not everyone.’ And I remind myself of that quite often. I must remember the bras that I was too ‘tired’ (read: lazy) to take good care of and just washed with my old Youth Services soccer t-shirts and dried with my bath mats and running shoes (yes, sadly, I was once that lazy), that are now shoved in the back of the drawer, only to be worn after finally convincing myself that even the slight distortion of my under wire would be far more bearable than letting my young ladies hang free. Because as nice as it is to be free and hang loose, there will never be a time when I couldn’t use a little (or not so little) support. On the 25th of February, I turned 25 years old. My golden birthday. I had scheduled my vacation for the entire week off, just in case my efforts to save over the past few months afforded me the opportunity to do something epic–possibly involving insane amounts of sequins and loud music, or statuesque young men in gorgeous dresses, lip-syncing songs from the soundtrack to my life. A flashback to my 24th or a prediction of my 25th? Hmmm…Perhaps a bit of both. So when my “fly-or-die,” Dru told me of plans for a trip to Thailand with his best friend Mo (another Mo) there was no hesitation. Ok, there was quite a bit of hesitation. Contrary to what my choice of career would lead you to believe, I actually do not love flying for long periods of time, and despite how amazing Thailand sounded in the stories from my coworkers on the jump-seat, it was never really on my list of must-visit countries. But that’s neither here nor there. I was ready to romp with the tigers and bathe with the elephants! Now, let me preface the following account by saying that I indeed truly enjoyed my time in Thailand, and I am far pleased with the experiences throughout my entire journey. But I now know that my gift to myself was not only the trip to a new country, but also the small truths that I learned about myself and life as a whole. A bit of background: as a flight attendant, I have the privilege of flying stand-by on other carriers, thus our travel plans for this epic birthday excursion centered on being able to do just that. Sounds pretty awesome, yeah? It is. Most of the time. If everything goes as smoothly as everyone else seems to tell you. So imagine the excitement when we got seats on the flight to Narita with no problems! We were on our way to Thailand! Just two long flights and one more short hop and we would be in Phuket, playing hide and seek in a field of tigers and bathing with elephants off the coast, right? Nope. 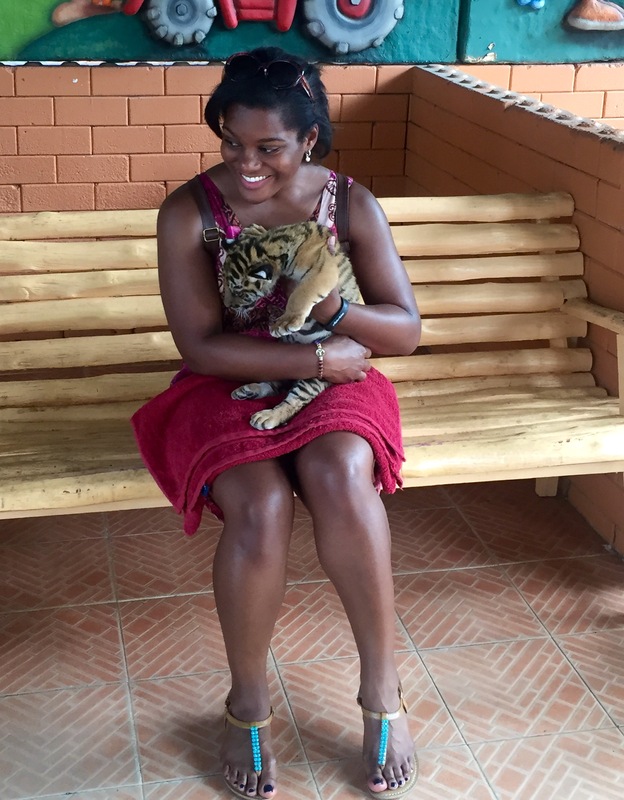 From the album of pictures of me chilling with a tiger by my side, and dancing along the floating market with a python around my neck, and giving a Thai massage to a crocodile, one might reasonably deduce that I’m a pretty fearless young lady. I’m not. In a time long ago. A time before the grand creation that is Netflix. A time when a trip to Blockbuster was the highlight of any sleepover, and late fees were still a thing, dear old Dad thought Broke Down Palace (a movie in which two young ladies get thrown into a Thai prison for smuggling drugs, one of whom has a roach crawl into her ear) was a good selection for movie night. Can we say traumatized?! So imagine the terror that ensued when I was approached by Japanese customs and informed that I (not we, I.) had a phone call after my bags had been scanned. I remained cool as a photo montage of scenes from Oz (the few scenes I’d happened to glimpse when pestering my parents when I probably should’ve been in bed) flashed in my mind. But no worries folks. It wasn’t a drugs planted in my carelessly unattended suitcase kind of thing; just a you shall not pass, because you can’t have a wild tale of an adventure with a seamless standby travel experience kind of thing. So, very long and frustrating story short (because, even this long after, I can’t seem to find any amusement or humor in that part of the experience) we exited the airport and re-entered to attempt the next leg of our journey. On to Bangkok! You could probably guess, nothing went as planned; and we found ourselves on a day long layover in Narita, which would include 4 hours next to the escalator that “goes to the third floor” on which one must “watch your step and hold on to the handrail” followed by a very brief moment of peace in the capsule hotel, and a quick excursion to the Narita- San Temple (which is now on my list of places to revisit) and then we were off to Bangkok! Finally. But not before a mishap in the restroom resulted in a waterlogged iPhone and a few failed attempts to purchase rice in an airport. Bangkok. Safe and sound. Hotel bound. Or so we thought. After finding that the train was no longer running, we hopped in a cab to our hotel. Our first hotel, that is. After two whole days of travel and sleeping on planes and in the airport, we couldn’t attempt to imagine that upon entering the cab we were embarking on a night-long quest through downtown Bangkok in search of a hotel. But we didn’t have to imagine it; we were living it. One over-priced, over-booked, run-down hotel after another, until we found the Mansion. And that’s exactly what it felt like to us at 3AM. We could now relax and spend the next four days being chauffeured around Bangkok by our new friend, Iff (our lovely cab driver who offered to take us everywhere imaginable, for the duration of our stay), cuddling baby tigers and watching their parents perform amazing feats, and getting carried through the land by elephants after a busy day of souvenir shopping on the floating market, and viewing some of the most creative fashions and performances by the lady-boys of Pattaya, and getting Thai massages, and having little fish nibble at our toes. We had a blast! And then we had to return. I’ll put it this way: no seats available. Seats available, however, you must make it through customs and security and to your gate within less than an hour. Sweat, tears and panic–but we made it to Dubai. Where we were informed that the next flight to the U.S. would not be until 2AM. So, a few more rounds around yet another airport, searching for ways to entertain ourselves and sleeping upright in the food court while the power drained from our devices until we could attempt our next flight to Dallas. Wide open. Plenty of seats. Music to our ears. Payload Restriction. A standby’s worst nightmare. I read my companions the first three pages of Modoc: The true story of the greatest elephant that ever lived, before I drifted off with a prayer that the trip not get any worse. At 1:45AM were handed boarding passes and told to hurry to our gate. At 1:47AM we were told that our bags were too heavy as carry-ons and that they must be checked (which of course by now would be impossible, with our flight departing in less than an hour). I felt my mind drift away as I heard the tiny cracks form over my heart, ready to shatter into a million pieces. But as I came back into focus, reminding myself that I was an adult and to have a meltdown in the airport was unacceptable, I saw the agent nodding in our direction and telling us to go on through. We ran as fast as we could to the gate. Finally. It’s all coming together! And then I heard a thud. I turned around to see the entire contents of my wallet strewn across the terminal floor. Darn it! All of my Baht, my Yen, my dollars, every receipt from every Burger King from Japan to Dubai, the fortune from that fortune cookie from that time a few years back when I had Chinese food that read, “You will soon be making a wise investment.” All over the place. Yup. I was that person. We made the flight. On to Dallas! Nothing too exciting in Dallas. Just missed the first flight to San Diego, by one person. Made it on the second though; and had the pleasure of meeting a lovely woman while waiting. She asked me about my travels and I told her of my trip to Bangkok. She then asked if I enjoyed my trip. Without a second thought I found myself telling her of all of the neat animals I’d seen and of the wonderful souvenirs I’d purchased at the market and of my travel buddies and our new inside jokes. All of the stress of the past few days and all of frustrations of my travel experience, not forgotten, rather irrelevant. Life, to me, can be that way sometimes. Sometimes life can feel like a series of unfortunate events; but when you look back, you find that those unfortunate events have woven themselves together to create a beautiful moment. And those beautiful moments are what make life worth living. As I stare into the mirror on our 400, which for some reason happens to magnify every single thing, I am horrified to discover that it is high time to nair my face. Goodness me! How long have I been walking around with a full beard and mustache. When did my eyebrows turn from them to it?! I realize I haven’t taken a deep breath in three minutes and need to leave the lav before I’m axfixiated by the smell of blue juice. And just as soon as I clear my lungs with recycled air, so is my mind cleared of any thoughts of the horrors found in my mirror. I’m dawning my sequined dress that I’ve been saving for a special occasion. I’m putting the finishing touches on my party lips and realize just how fabulous I’m look. I clean up quite nicely if I do say so myself. And it doesn’t hurt that this mirror makes me look like a 6’3 super model. Yasssss! I’ve just finished blow drying my hair and am placing my blow dryer in my hair drawer, when I hear the crack of my hand mirror. I look in the drawer to see a bunch of tiny Morgan’s staring back at me. The first thought to cross my mind (of course after the initial shock of 7 years of bad luck) was how am I going to see how great I look from behind? Call it vain, but I have a bit of an obsession with mirrors. The neat thing about mirrors isn’t the mirror itself, yet what it reflects. What’s reflected in a mirror depends not only on what’s placed before it, but also who’s looking and from which angle they’re looking; and to take it a bit further-what you’re looking for. That’s another special thing about mirrors, the reasons we use them. Obviously mirrors show us what we can’t naturally see for ourselves–but we use different mirrors for different reasons. There’s a mirror above my sink so I can see myself as I brush my teeth. My full length mirror is to see how professional I look in my uniform. My rear view mirror shows me just how close I am to hitting the itty bitty Fiat behind me. The compact I keep in my apron shows me just how long I can go without getting my ‘stache waxed (not long at all)! Close friends. Mirrors are like close friends. We look to our friends to show us things which we cannot on our own see. Our friends close friends confidants, reflect to us what we’ve presented before them. I’ve have this friend (no, really, it’s my friend-not me) who begins nearly every conversation with, “So tell me if I’m wrong, because I know that you will.” I kid you not, every conversation between us begins this way; and the ones that don’t begin with, “Girl, let me tell you what happened!” I find it quite amusing; but moreover, I find fulfillment in knowing that I’ve presented myself to her as not only someone of moral character, but also an ear to listen. I value my interactions with people. I feel that there is a purpose in each experience I have with others. Interactions are series of responses. Responses are reactions. Reflections of what or who you are. I use these moments to self-evaluate. I use my reflection that I see in others to decide whether or not I’m showing others what I want them to see. The reflection in my mirror inspires confidence. It shows me that I’m presenting my best face to the world. The reflection in my mirror inspires self-improvement and acceptance. It shows me that I have flaws that may be visible the longer and closer I stand before it. It also shows me that if I present myself in a different light and at a different angle, those flaws are minor details. My mirrors in life give me confidence. My mirrors in life are my confidants. What more does a young woman need in this life? Besides wine, that is. I wash my hands a lot. Says everyone. But really, I do. Well at work at least. So imagine my surprise, after having washed my hands for what could certainly have been the 10th time in two hours, at feeling the burn of a tiny cut on the back of my hand. How did that happen? Better yet, when? Somewhere between the final wash during deplaning and making it home sweet home, I’d nicked my hand. It obviously didn’t hurt when it happened, and apparently came from something completely ordinary, but the damage- albeit tiny and probably temporary- was done. Oftentimes after a few days of working, I can almost certainly find a new bruise somewhere on my body. Usually doesn’t hurt unless I poke at it (which is what you’re supposed to do with mysterious bruises), and I can hardly ever account for when or how I got them; but something definitely hit me with enough force to leave a mark. I think that’s how life works. Life’s lessons aren’t always big, bold, “it came to me in a dream” messages; rather they’re often pretty subtle and some even downright stealth. It’s like you’re going about life as usual and one day you notice something or someone has affected you in a way you’d almost never notice. Sometimes you won’t even know you’ve been taught a lesson until you feel the light sting as you’re cleaning yourself up or taking a good look at your reflection in the mirror. And while you may never be able to account from where the scars or bruises came, you’ll notice they’re there and until they’re not, you’ll be a bit more cautious and a bit more aware of your actions with a subconscious desire to avoid that which has pained you. Yet, just as soon as the sting of your cuts and tenderness of your bruises subside, so too does your quest for the source. I think lemons get a bad rap. When your car’s a piece of junk, you call it a lemon. When you’re dealt a bad hand in life, you say life’s given you lemons. I don’t think breaking a mirror gives you bad luck. Though, that is what ‘they’ say. I guess life gives you lemons when you break mirrors? Seven years worth of lemons, I guess. That’s a lot of lemonade. Sounds like cavities and weight gain to me. Which, I guess, is more lemons. But what if lemons weren’t such a bad thing? Then you wouldn’t have to make lemonade. (Not that lemonade is so bad–unless you drink seven years worth of it, causing cavities and weight gain). What if you took the lemons as a gift from life and not a punishment for breaking mirrors. Then you could put lemons in your water and drink more water. That’s pretty healthy. Or you could clean your house (yes, your entire house) with lemons. That’s a good thing too. But then why would you get a gift for breaking a mirror–that’s supposed to be bad, right? Maybe breaking a mirror isn’t such a bad thing. Maybe it’s a sign. Perhaps it’s time to look into a new mirror, or see a different reflection. Maybe shattering your old reflection in your old mirror is a good thing. Could it be that your new reflection in your new mirror will be something better that you never would’ve seen in your old mirror; and maybe life is proud of your new discovery so it gives you lemons? Lemons that you can now put in your water or clean your new mirror that shows your new you with?